Traveling to Luang Prabang for a week didn’t give me much time to see everything I wanted so I scrapped a lot of my plans and took a one day Motorcycle tour with Motolao to see more of the countryside around Luang Prabang by motorcycle. Making a booking in the Tiger Trail office in the high street couldn’t have been easier. Next day I’m picked up by their guide and taken to a cool looking place called Motolao cafe, some kind of food garage with an industrial vibe to it. We, a group of three got fitted up with all the riding gear, cleared the paperwork, got shown around the bike and hit the road. I was wondering how much fun you can have in one day on bikes around Luang Prabang, well within 15 minutes of leaving town we were on a nice trail, passing small villages along route, surprised about how rural things had become so quickly, nice. We finish the first part of the trail and get on a Tarmac section for about 20 kilometers; we came across two huge Elephants, amazing animals. A drink stop and a few snacks later we are on another dirt road. 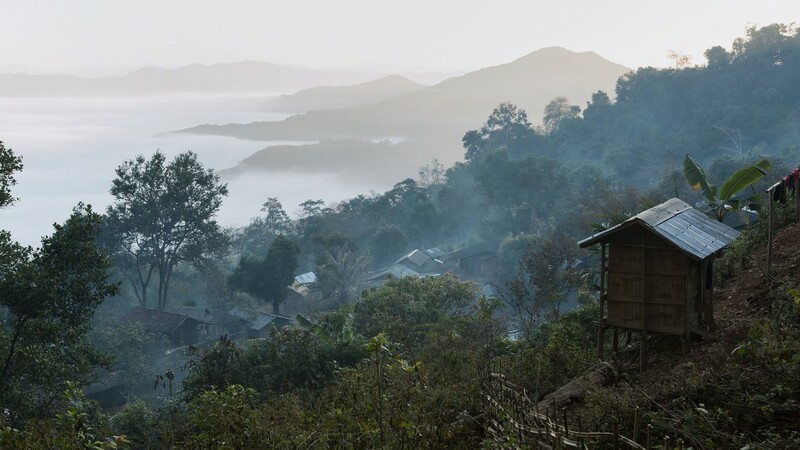 This one takes us up through the mountains where it is cool, the views are amazing with a few small villages scattered around, Lao children playing, animals wandering around, unreal we are only an hour or so from such a big city and tourism center like Luang Prabang. The trail wound around the Lao countryside, it seemed endless, the decent started and got really technical riding with large rocks and potholes made it really tough to push the bike through… I was getting on ok until I hit a large rock and got catapulted of the bike landing heavily on my right hand immediately I knew something is wrong. I was gutted, only 2 kilometres or so from the finish of the difficult part of the trail, damn. The boys from MOTOLAO sprung into action, one of them walking me down the mountain, they made me a sling and we ambled down. When we arrived at the bottom we had to walk across a river to the village were help was waiting to run me back to the Luang Prabang Hospital, this made me think about the people from MOTOLAO and how they cope with such problems!? On my arrival in Luang parang I was met by the Management team and a translator of provided by MOTOLAO and ushered to the X ray room in the local hospital, my wrist was dislocated and fractured. I would have to return to Thailand to get it fixed, I spent and uncomfortable night in the Hotel in a great deal of pain. The next day more staff members turned up to see me, bringing me some much needed strong pain killers, nothing was to much trouble for them and they took care of me where they could. Sitting back at home now after an operation in Thailand I reflect on my trip and still say, it was fantastic! I didn’t regret a single moment after all. There is so much to see just on the outskirts of Luang Prabang, and I’ll be back in Laos for more motorcycle trips into the countryside once I’m healed. The trip with MOTOLAO has opened up a whole new world of adventure for me and soon you will see me again on the roads and track of northern Laos. Thanks to all members of MOTOLAO, and see you soon.